They say that you can never forget your first tiger sighting in the wild. The majestic walk, the earth shattering roar and the easy but arrogant confidence apparently imprint him in your mind forever. With such descriptions and statements in mind I set off back in late January 2009, to the Jim Corbett National Park in Ramnagar, Uttarakhand to join that relatively small club of people who have seen the magnificent beast in the wild. While two days of frantic dashes and sudden hushed stops throughout the length and breadth of the Brijrani area of the park did not yield even a small glimpse of that much praised animal (except for some fresh pugmarks), in all those wanderings I did get to see an amazing variety of bird life both in Corbett and a few days later in the Keoladeo Ghana National Park in Bharatpur, Rajasthan. And in the latter I saw a sight that completely drove the tiger from my mind. It was the most beautiful bird I had ever seen in my short birding career. But more about this bird and the Bharatpur sanctuary later. Let me first guide you through the foggy grasslands, thin gurgling streams and cool woodlands of Corbett by conveniently concentrating on birding aspects of the trip and ignoring for most part our increasingly desperate attempts to spot a tiger. We reached Ramnagar too early to enter the park so our jeep driver took us to the Kosi river to pass time. It was still dark but a thin light was breaking out in the east marginally illuminating the murky riverbed that was mostly dry except for a small flow. As we stumbled over the smooth and rounded pebbles of the river bed, a sudden clear ringing rent the perfectly still dawn air. It was the di-geri-doo call of a lapwing. Although it was still too dark to see the bird. I wanted to hang around a bit for the light to brighten to identify the lapwing and see if there were any more birds but it was time to proceed to the park. As we waited to collect our park entry permits at the Brijrani gate and be assigned a guide we saw that ubiquitous septet, the Jungle Babblers (Turdoides striatus) hopping around. After we proceeded into the park, as soon as we passed the buffer zone and were crossing a shallow stream we saw a Red-wattled Lapwing (Vanellus indicus) running away from us. After crossing the stream and climbing the crest of a small mound we found a rivulet below on our left in which we observed through the rapidly thinning fog a group of Black Storks (Ciconia nigra) out fishing early. We continued towards the canteen at the beginning of the park proper to quieten our grumbling stomachs. Stomach filled, I was sipping on some hot Bournvita when I spied a little bird hopping around the tables in front of the canteen with its tail raised. 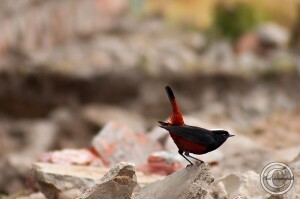 It was a White-Capped Water Redstart (Chaimarrornis leucocephalus), a bird I did not expect to be so used to civilization. No sooner had we left the canteen, our guide Mahesh pointed out a Lesser Flameback Woodpecker (Dinopiumbenghalense) in the distance seemingly bent on breaking its beak on the bark of a tree. As we were driving through a wooded area we heard the harsh bark of an Indian Muntjac (Muntiacus muntjak) from near us and stopped by the side of the track to investigate. A flash of color in the dense bushes next to us sent our pulses racing. Alas, it was not a tiger passing through. 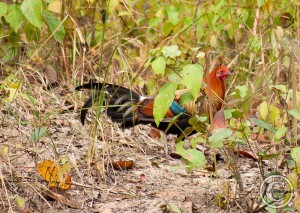 It was only a “lowly” timid Red Junglefowl (Gallus gallus) giving us the once over with its bobbing head! Towards late afternoon we made our way towards the Malani region of the park to catch a glimpse of the core forest area that no day visitors are allowed to enter even with entry permits. 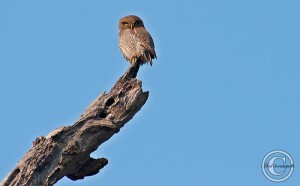 Mahesh, sharp as ever, pointed out a group of birds in the distance sitting high in the branches of a tree well above the average tree cover. Their bare, red colored fleshy necks gave them away instantly. It was a group of Red-Headed Vultures (Sarcogyps calvus) seemingly relaxing under the late afternoon sunshine. After tempting me throughout the day among the many grasslands that litter the park, I finally managed to get a good close-up photo of a Grey Bushchat (Saxicola ferrea) as we made our way back to the main gate. Just before we passed into the buffer zone, Mahesh spotted a lone bird atop a tree in the distance. He identified it as a Oriental Pied Hornbill (Anthracoceros albirostris) which we soon confirmed through the good offices of the zoom button on my camera. 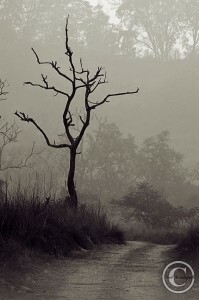 And with that ended our first day in the Corbett National Park.